Download the archive with Kutululu. 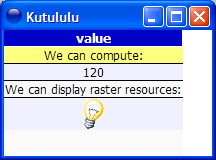 Kutululu.exe argument specifies name of the module to load and run. The resource with the name of module is executed (so test loads module test and executes resource test).